The wait was pretty long and when the waffle finally came, I looked at it with a bit of disappointment. The waffle was kind of small and not the Belgian sort that I usually prefer. 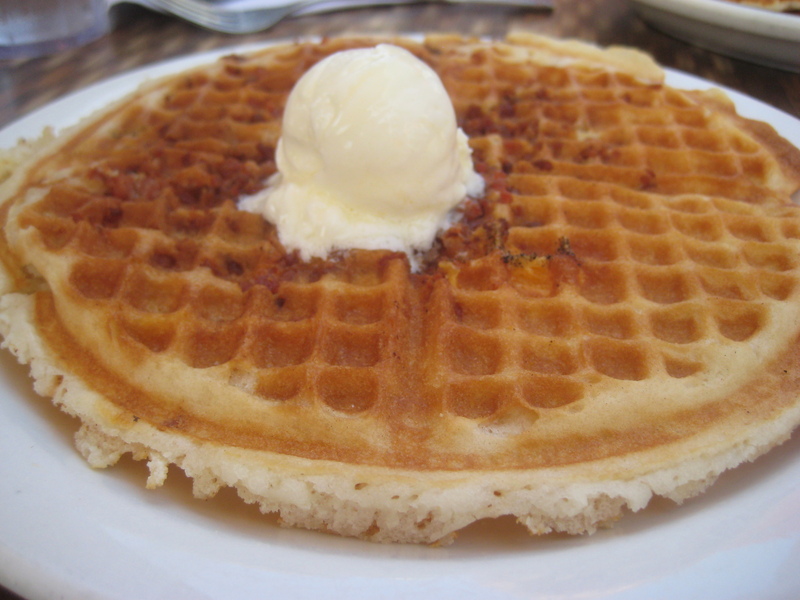 Plus, I quickly found that the bacon and cheese had been cooked into the waffle, but it didn’t look like much. Neither of those ingredients were really dispersed around the waffle, so it looked like this was kind of a bust. There was a big dollop of butter on top, and I set to spreading it out to find out if this waffle would be as disappointing as it looked. Once spread, I sliced away and started eating. I found that the taste was definitely better than the look. The batter itself was pretty good and the cheese and bacon definitely added a unique taste, but it was still missing something. Ah yes, syrup. I grabbed that syrup and poured it onto the waffle pretty liberally. This proved to be a most wise decision. The syrup added the sweetness to balance out the saltiness that the bacon and cheddar had added and turned a decent waffle into a much better meal. The bacon and cheddar waffle turned out to be less of a bust than I had expected. In fact, with the addition of the syrup, it was quite good. They really could have spread the ingredients out more and although I was happy, I knew that waffle wouldn’t be replacing the chicken and waffle anytime soon.